Although tooth decay is a major problem to watch for in your child’s teeth, it isn’t the only one. As their teeth transition from primary (“baby”) to permanent, you should also be on the lookout for a developing poor bite or malocclusion. 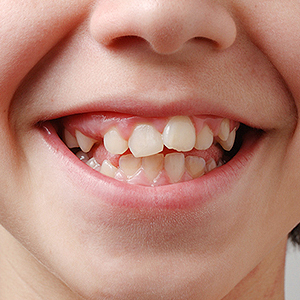 Although the signs can be subtle, you may be able to detect an emerging malocclusion, starting usually around age 6, if you know what to look for. Here are 4 signs your child may be developing a poor bite. Excessive spacing. This is something that might be noticeable while the child still has their primary teeth. If you notice an excessive amount of space around the front teeth, the sizes of the jaws and the teeth may be disproportional. Abnormal overlapping. The upper teeth normally just cover the bottom teeth when the jaws are closed. But a malocclusion may be forming if the lower teeth cover the upper (underbite), the upper teeth extend too far over the lower (deep bite) or there’s space between the upper and lower front teeth (open bite). Different overlapping patterns. Watch as well for some of the teeth overlapping normally while others don’t, a sign of a cross bite. For example, the back upper teeth may cover their counterparts in a normal fashion while the lower front teeth abnormally overlap the top front. The roles here between front and back teeth can also be reversed. Abnormal eruptions. Permanent teeth normally follow a pattern when erupting, but certain factors could disrupt the process. For example, a jaw that’s developed too small can cause crowding as incoming teeth vie for space; as a result, some permanent teeth may erupt out of their proper position. Likewise, if a baby tooth is out of its normal position or prematurely lost, the permanent tooth may erupt out of position too. The good news with each of these developing bite problems is that we can correct them or at least minimize their future effect if caught early. So if you notice any of these signs or anything else out of the ordinary, see an orthodontist as soon as possible. It’s also a good idea to have your child undergo a thorough orthodontic evaluation around age 6.